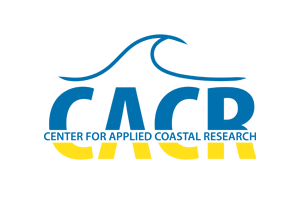 Graduate students in the Center for Applied Coastal Research are comprised of students from the Coastal Engineering program in the Department of Civil and Environmental Engineering and students from the Coastal Engineering program. We offer rigorous master’s and doctoral programs related to Coastal Engineering and Ocean Engineering. Students work closely with their advisor undertaking research culminating in a thesis or dissertation. Non-thesis options are also available. The links below provide additional details on the various degree programs offered. (M.C.E.) Master of Civil Engineering: concentration in Coastal Engineering. – requires 30 credits (24 course credits and 6 thesis credits) A bachelor’s degree in engineering is required for this program, with a min. GPA of 3.0. (M.A.S) Master of Applied Science: concentration in Coastal Engineering – requires 30 credits (24 course credits and 6 thesis credits) For students who have earned a bachelor’s degree in a non-engineering field, with a min. GPA of 3.0. (M.S.) Master of Science in Coastal Engineering – requires 30 credits (24 course credits and 6 thesis credits) A Bacehlor of Science in engineering is required for this program, with a min. GPA of 3.0. (M.C.E.) Master of Civil Engineering: concentration in Coastal Engineering. – requires 30 course credits A bachelor’s degree in engineering is required for this program, with a min. GPA of 3.0. (M.A.S) Master of Applied Science: concentration in Coastal Engineering – requires 30 course credits For students who have earned a bachelor’s degree in a non-engineering field, with a min. GPA of 3.0. (Ph.D.) Doctor of Philosophy-Civil Engineering: concentration in Coastal Engineering (72 credits required or 42 with earned master’s degree in engineering) A bachelor’s degree in engineering with a min. GPA of 3.5 OR a master’s degree in engineering with a min. GPA of 3.0. (Ph.D.) Doctor of Philosophy in Coastal Engineering (72 credits required or 42 with earned master’s degree in engineering) A bachelor’s degree in engineering with a min. GPA of 3.5 OR a master’s degree in engineering with a min. GPA of 3.0. Problems of design in the ocean and coastal environment. Mechanics of wave motion, tides and storm surge, littoral processes, wave forces on structures and design of coastal structures. Includes observations of hydraulic model tests in the Ocean Engineering Laboratory. PREREQ: MECH305. Kinematics and dynamics of incompressible fluids with emphasis on engineering problems in the hydraulic and hydrologic environment. Governing equations, solutions for laminar, creeping and porous media flows. Turbulence, boundary layers, potential flows, water waves, and stratified and rotating systems. PREREQ: MECH305. Acquaints the engineer with the problems of design in the ocean. Water waves and tides, wave forces on structures, corrosion and fouling, coastal structures and littoral processes. PREREQ: MECH305. Primary emphasis on linear water wave theory and its applications. Shoaling, refraction and diffraction of waves as well as wave forces. Finite amplitude waves. Laboratory experiments to verify the theoretical developments. PREREQ: MECH305. Description and usage of the commercial Matrix Laboratory (Matlab) software for analyzing multi-dimensional engineering data sets and formulating numerical models of engineering processes. Application of hydrodynamics to mixing and transport processes in the water environment. PREREQ: CIEG672. Mechanics and mathematical modelling of sediment transport in unidirectional and oscillatory flow; sediment properties, initiation of sediment movement, bedload and suspended load transport rates, formation of bed forms and flow resistance, erosion and deposition in the vicinity of structures, and practical applications. PREREQ: MECH305. Coastal morphology, equilibrium beach profiles, onshore-offshore response, sediment transport relationships, sand budgets around inlets and along open coasts, modeling of shoreline response, analyses of beach problems and recommendations of remedial measures. Concepts of amplitude and energy spectra, covariances and cross-spectra; linear response functions; use of the Fast Fourier Transform for ocean engineering applications including analysis of one-dimensional and directional spectra, probability of ocean waves and wave forces. RESTRICTIONS: Requires permission of instructor. The mechanics of waves and currents in the nearshore zone: wave breaking, surf zone dynamics, cross- and long-shore currents, turbulence and bottom boundary layers, infra-gravity and edge waves and nearshore modeling. PREREQ: CIEG672 and CIEG639. Principles of finite difference, finite volume and finite element approaches for basic parabolic, hyperbolic and elliptic partial differential equations. Stability and conservation properties of basic schemes. Coastal engineering applications for surface waves, nearshore circulation, sediment transport and morphology. Introduction to popular models in each area. PREREQ: CIEG672 and CIEG639. An independent investigation under supervision of a member of the civil engineering graduate faculty. Naval hydrodynamics, behavior of submerged and floating bodies, and ship waves. Tsunamis and harbor response. PREREQ: CIEG672 and CIEG639. Development of finite amplitude wave theories such as solitary, conoidal stokes and stream function. Application to coastal and ocean engineering problems. PREREQ: CIEG639, CIEG672. Research and readings in preparation of dissertation topic and/or qualifying examinations for doctoral students before admission to candidacy but after completion of all required course work. RESTRICTIONS: Not open to students who have been admitted to candidacy.